Every Thursday, we dig through the Paste Cloud archives to revisit some of our favorite old concert videos and audio. This week, we’ve got material from Bruce Springsteen, Etta James and Lynyrd Skynyrd. If Elvis is the King of Rock ‘N’ Roll, Springsteen must be nothing short of a god. 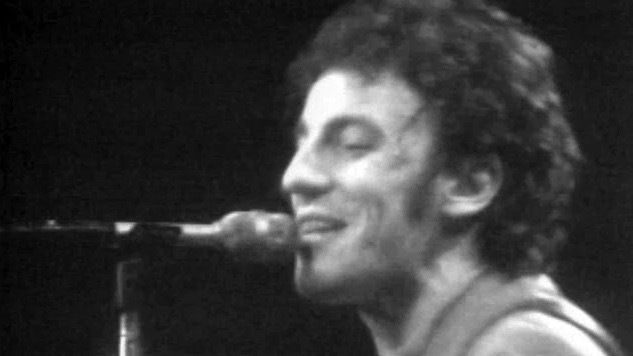 His divinity would also explain the religious experience that is this 1978 concert at Capitol Theatre in Passaic, N.J.
Over the course of his 10-song set, the Jersey boy enjoys a welcome homecoming from the audience, and Springsteen is seen more at home during this performance than he is anywhere else in the world. From the first few notes of the band’s searing opening song “Badlands,” Bruce and company are unrelenting as they play through hit after hit. Even the deeper album cuts performed by the band feel like chart-toppers thanks to their dynamic performance. It is not even the second song into the set when Springsteen first finds himself submerged in the crowd of crazed New Jersey fans, arguably the most enthusiastic fan base in history. While finishing up “Spirit of the Night,” Bruce is honored to have been given a handmade cloth sign from a fan, which only bolsters his performance as the band dives right into “Darkness On the Edge of Town.” While the Boss gives himself a minute to cool off during the song’s more somber moments, his energy comes back in full force by the time the chorus comes around. Etta James was one of the most celebrated soul singers of all time. She was one of the acts signed to the legendary label Chess Records. In this exceptional performance from the Newport Jazz Festival on August 17, 1991, Etta James had just came out of a stint from rehab three years earlier, but she comes through in this performance firing on all cylinders. The first two tracks in this set are instrumentals performed by James’ backing band. It’s not until the third song, “Breakin’ Up Somebody’s Home,” that Etta James actually takes the stage. Ill-fated but triumphant, Lynyrd Skynyrd are the tragic heroes of rock ‘n’ roll. The group first assembled in Jacksonville, Florida in the ‘60s as My Backyard, later renaming themselves after the high school P.E. teacher who enforced a rule against boys with long hair. It was a goofy, self-referential measure of rebellion, seeing how everyone in the band boasts a full head of collar-grazing locks. Leonard Skinner eventually turned into Lynyrd Skynyrd, as they became monumental emblems of the Southern rock genre. This vintage footage shows their concert at the Winterland Ballroom in San Francisco on March 7, 1976 as part of the Nuthin’ Fancy Tour. The set begins with “Cry For The Bad Man,” a song about the fallout over fiscal responsibilities between Ronnie Van Zant and the former manager of the band, Alan Walden. Even though the frontman lacks mobility in his live performance, Van Zant’s hearty, robust voice firmly holds its ground as he clutches at the mic stand. During “Gimme Back My Bullets,” the title track of the album they just released, Gary Rossington delivers a sleek guitar solo in a whirlwind of black strands and ornate tunic embellishments. A micro-moment into “Sweet Home Alabama,” the audience is already cheering wildly and burgeoning with excitement. The song started off as a little riff that Rossington came up with while waiting for his bandmates to show up for rehearsal and turned into one of the most beloved Americana tunes in recent music history. The band thrives off of the sing-along communion that the crowd-pleaser brings, joyously tearing it up on the drums and keyboard as they perform.